We strongly urge you to fly into the Santa Barbara airport - although it may cost slightly more than flying into Los Angeles (LAX). The time and hassle saved will be more than worth it. UC Santa Barbara is an easy 5 minute taxi ride (or Uber or Lyft) from the Santa Barbara Airport; a list of taxi services is available below. For Santa Barbara Airport travel information regarding flight, or ground transportation visit www.flysba.com. United Airlines offers several daily nonstop flights from San Francisco (SFO) and LAX to the Santa Barbara Airport. American Airlines offers nonstop flights from LAX, but flights from SFO transfer in LAX. For those of you who can't resist the lowest ticket price and fly into LAX, there is a shuttle service (https://www.sbairbus.com/page/display/laxshuttle) that makes one stop on the way and then drops you in Santa Barbara. The price is $94 roundtrip for 1 person (discounted prepaid - if payments are made 24 hours in advance) and takes approximately 2-3 hours in the best of traffic. Rate: $1.90 when cab starts and 2.70/mi. 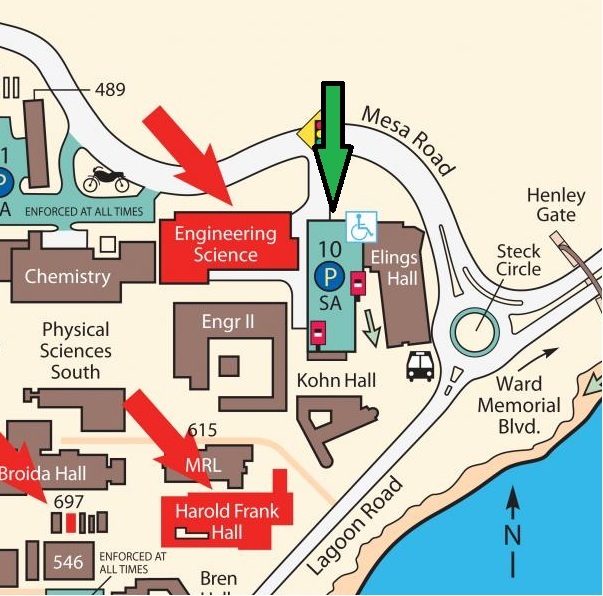 Exit the 101 freeway at the Airport / UCSB (Route 217) off-ramp and proceed through the Henley Gate at the east campus entrance. Make a right turn as you enter the round-a-bout onto Mesa Road. Make a quick left turn at the first stoplight into Lot #10, a multi-story parking structure. Take the Los Carneros exit (Number 107) off U.S. 101 and continue on Los Carneros Road for about 1.5 miles. Make a left turn onto Mesa Road (marked with UCSB sign). Continue on Mesa Rd past 1 stop sign, and 2 traffic signals. At the 3rd light, make a right turn into Lot #10, a multi-story parking structure. Please park at the Lot #10 parking structure (indicated with green arrow in map below) unless otherwise instructed. Park on the first level in a numbered (but not "restricted") space, and purchase an appropriate permit from one of the dispensers (near the elevators). We recommend Pacific Suites since it is very close to campus. Another choice is the Best Western Plus.